Prince George's County Police released a new composite sketch of a homicide victim they have not been able to identify. The woman was found shot multiple times in the parking lot of the Lynnhill condo building in the 3100 block of Good Hope Avenue in Temple Hills, Maryland, about 10 p.m. Jan. 15. She died at the scene. She didn't have identification, a cellphone, a purse or a wallet. Police released a new composite sketch of the woman and one of her tattoos Monday. The victim was between 25 and 30 years old, weighed 125 pounds and stood 5 feet 6-inches tall, police said. She had several tattoos on her body, saying "just love," "no lies," "peace," "JMS" and "Crybaby RIP Jalen." "She's someone's child," Prince George's County police Assistant Chief Sammy Patel said. "There's no other way we can start this investigation truly without identifying who she is." 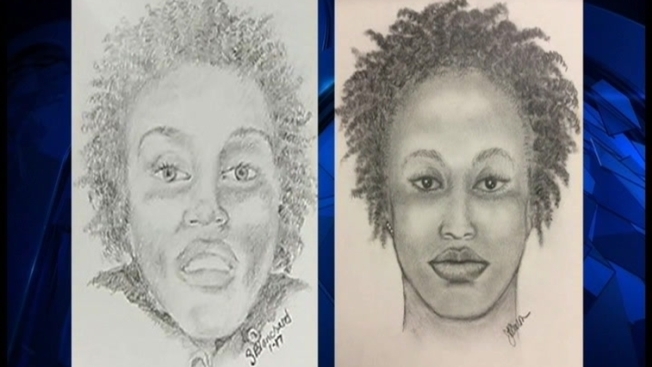 Investigators said they are working with law enforcement agencies nationwide in an effort to identify her. They entered everything they collected about her into the National Crime Information Center database to see if she matches the description of any missing person from across the country. Anyone with any information about her identity is asked to call 301-772-4925.